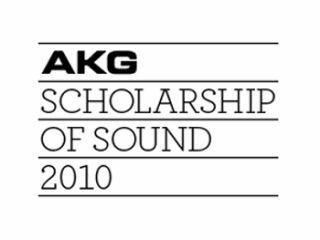 PRESS RELEASE: AKG announce today that they will be offering ten talented electronic music producers and sound students from across Europe the unique chance to take part in the first edition of the AKG Scholarship of Sound. The Scholarship, taking place in Berlin in August 2010, will provide a life changing opportunity for participants to develop a greater understanding of sound, music production and audio engineering under the tutelage and guidance of highly respected artists, music producers and music professionals. AKG, the manufacturer of high performance studio, broadcast and live sound equipment, has set-up the Scholarship of Sound to support talented young European artists and students by sharing the knowledge of industry pioneers and innovators and drawing inspiration from one of Europe's most culturally diverse cities. The search for candidates opens on Tuesday 4 May, with applicants invited to submit their applications via Scholarship of Sound. The deadline for applications closes on 13 June, after which the applicants will be judged by an industry panel. The winning scholars will be announced from 23 June with the scholarship, flights, accommodation and living expenses entirely covered by AKG. The lucky winners will take part in the scholarship from 31 July - 7 August at the Berlin AKG Studio. The students will enjoy audio workshops and mentoring sessions led by some of electronic music's leading artists and professionals, alongside the discovery of Berlin's most influential musical spaces. Music Producers / Professional Sound Engineers - If you are an electronic music producer, your application will need to include your answers to two questions concerning your motivations to become a professional electronic music producer and to take part in the AKG Scholarship of Sound ("Event") and a link to your musical production.